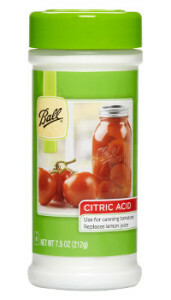 Due to its frequent use in canning, Citric Acid can be found in most grocery stores. If it’s not stocked alongside the mason jars, check the baking ingredients aisle. Food grade Citric Acid can be purchased online, in both small and bulk quantities. Always make sure you are purchasing food-grade product if you are using it as a food or beverage ingredient. A retail-size container (7.5 oz) of citric acid, which can typically be found at your local supermarket or big box store. Citric acid, as its name suggests, is a weak organic acid that is naturally present in citrus fruits. It is also present in other fruits and vegetables but to a much lesser extent. Lemons and limes are the richest and citric acid makes up about 8 percent of their dry weight. Citric acid is an odorless white powder with a granular to fine texture and a marked sour taste. Before 1917, fruits were the main source of this acid but, in 1917, a much cheaper alternative was discovered by James Currie, an American food chemist. Since citric acid is a by-product of metabolism in a number of organisms (for those who remember the infamous Kreb’s Cycle), a mold called Aspergillus niger aka black mold is used today to produce mass quantities of this acid by supplying this mold with a sugar (sucrose or glucose). The sugar is metabolized and citric acid is produced, extracted and purified for commercial use. From beverages to “sour” candies, from chips to ice cream, you are most likely to find citric acid (or E330) listed in the ingredients. It has long been recognized as one of the most commonly used as well as efficient preservatives in the food industry. Being an acid, citric acid makes the pH acidic which is highly unfavorable for the growth of most bacteria and molds, namely Clostridium botulinum that causes botulism. For this reason, it is used in canned goods, jams, jellies and any other product intended to have a long-shelf life. Another important attribute of citric acid is its tarty lemon-like taste. It is a great alternative to real lemon juice, mimicking both the flavor and effect. Hence, it is used widely in the beverage industry as a flavor enhancer. As it is available in a dry powdery form, it can be used to enhance the flavor in dry products like seasonings and potato chips as a substitute to vinegar or lime. Be the first to comment on "Citric Acid"